In Indian corporate culture, saris are required to be worn in an elegant manner avoiding navel exposure. Different courts adopted their own styles of draping and indigenizing the sari. In most of the courts the sari was embellished with stitching hand-woven borders in gold from Varanasi, delicate zardozi work, gota, makaish and tilla work that embellished the plain fabric, simultaneously satisfying both traditional demands and ingrained love for ornamentation. Some images of maharanis in the Deccan show the women wearing a sleeveless, richly embellished waistcoat over their blouses. The Begum of Savanur remembers how sumptuous the chiffon sari became at their gatherings. At some courts it was worn with jaali or net kurtas and embossed silk waist length sadris or jackets. Some of them were so rich that the entire ground was embroidered over with pearls and zardozi. 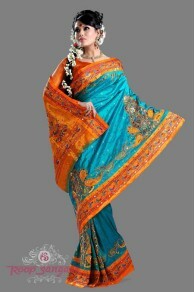 Due to migration to Western countries like South Africa, many Indian women began to wear the normal sari below the waistline exposing the navel, known as low-rise sari or low hip sari. Also due to liberalization and changing global fashion trends, saris are reemerging as a dress which can expose as much as it conceals. 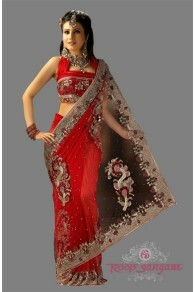 As a result, saris began to be designed in many innovative ways and materials. Transparent and semi-transparent saris made of sheer fabrics like chiffon are an example. These saris are tied in different wayssuch as petticoat being tied at about 4–6 inches below the navel or where the blouse is small and ends just below the breasts and the pallu is thin, thereby exposing the some part of the blouse and almost the entire midriff. Some even wear navel jewels or navel piercings to draw attention to the navel. These were made popular by the celebrities of Bollywood industryand other popular regional film industries like Kannada, Tamil and Telugu cinemas. Wearing the sari below the navel doesn’t always lead to exposing it as the navel is covered with the pallu in a low-rise non-transparent sari.